Find out which nutrients are important during pregnancy and how to boost them through your diet. You will have no doubt heard people telling you not to worry about what you eat while you’re pregnant, seeing as you’re ‘eating for two’. Despite their best intentions, there’s no need to double your calorie intake, although most women will need to eat a bit more as their pregnancy progresses. But while you won’t need a massive increase in calories, you will need to bump up some key nutrients. You can cover these extra needs with supplements, but what you eat also plays an important role. Here’s the low down for a nutrient-rich pregnancy. 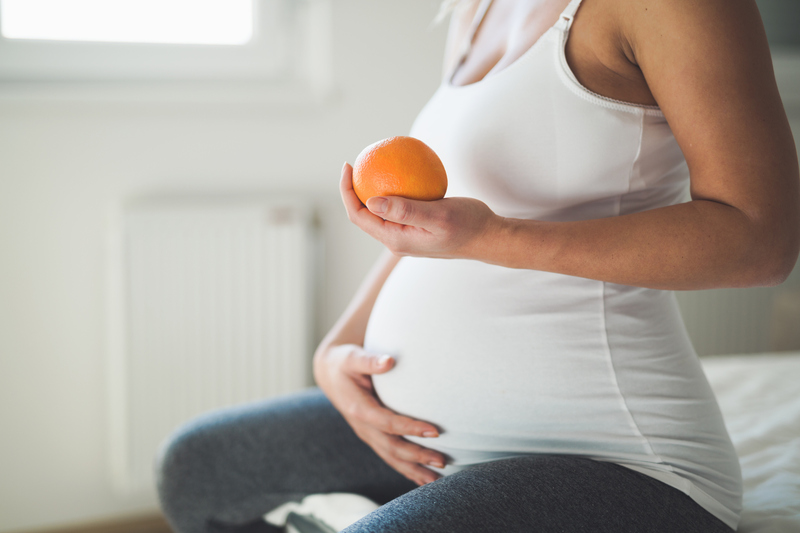 Pregnant women in Australia are advised to boost their intake of folate, which will help to significantly reduce the baby’s risk of developing neural tube defects such as spina bifida. You can do this by making sure you eat a diet that’s rich in folate – some of the highest levels of naturally-occurring folate are found in green leafy vegetables like spinach, asparagus and brussel sprouts, or in fruits like oranges, strawberries and bananas, as well as legumes like lentils and chickpeas. In Australia, bread flour is fortified with folic acid, as well as some cereals. But no matter how much folate you manage to fit into your diet, it’s recommended that all pregnant women also take a daily supplement with at least 400 micrograms of folic acid, which should be taken for at least one month before you become pregnant and throughout the first trimester. When you’re pregnant or breastfeeding, you need much more iodine than normal, which is a crucial nutrient that your baby needs for its brain and nervous system to develop. It’s also a nutrient that tends to be found in quite low levels in Australian food supply. Seafood, eggs and dairy products are good sources, and most leavened bread in Australia contains iodised salt. But even if your diet includes these, you’re unlikely to get enough, so you’ll need to take a supplement of 150 micrograms each day throughout the entire pregnancy, as well as when you are breastfeeding. Zinc and protein are very useful for the normal growth and development of your baby, but luckily these two nutrients are easily found in the foods you eat every day. They are both found in lean meats, poultry, fish, eggs, tofu, nuts, seeds and legumes. The latest Australian dietary guidelines recommend that women eat two and a half servings of these protein-rich foods each day — but pregnant women need an extra serving, so aim for three and a half servings each day. What’s a serving size? A cup of cooked beans or lentils, 2 eggs, 80 grams of cooked chicken or 65 grams of cooked lean red meat are some examples. The amount of blood in your body actually increases by 50 per cent by the end of your pregnancy, which means you’ll need more iron to make the extra red blood cells that carry oxygen around your body. You’ll also need more iron than normal because your baby and placenta will be busy drawing what they need from your supply. As they grow, they will demand more and more! Meat is the best source of iron as the body more easily absorbs it this way, but iron can also be found in seafood and green leafy vegetables, especially if they’re eaten at the same time as foods that contain vitamin C, such as tomatoes and oranges. But not all women are able to get enough iron through their diet alone. Talk to your doctor about whether you need a supplement. This is especially important if you’re eating a vegetarian or vegan diet. Fish is high in beneficial omega 3 fatty acids—and iodine. Most types of fish are safe to eat two or three times each week, but there are some exceptions. Large deep-sea fish like shark, marlin, swordfish and orange roughy contain higher amounts of mercury than other fish and should be limited. Constipation is common for many pregnant women, but eating lots of fibre from wholegrains, vegetables, fruit and legumes can help combat it. Make sure you’re also drinking enough water. A little bit of caffeine is safe, but be careful not to consume too much. Limit yourself to 200 mg caffeine each day – that’s the equivalent of about 1-2 cups of espresso style coffee, 3 cups of instant coffee or 4 cups of medium strength tea. Don’t forget that soft drinks, chocolate, and sports and energy drinks also contain caffeine. Alcohol can disrupt development of the brain and central nervous system of the unborn child. For the health of your baby, the safest option is to stop drinking before you conceive and not drink throughout pregnancy. For more info on healthy eating during pregnancy and a list of foods to avoid due to high risk of food poisoning, check out this fact sheet. If you need some extra guidance or support, visit a nutritionist or dietitian to create a tailor-made eating plan for you. You can claim benefits for a consultation with dietician as part of Medibank’s Growing Family Extras cover.